“People do what people see” is how John Maxwell begins his chapter on the Law of the Picture. 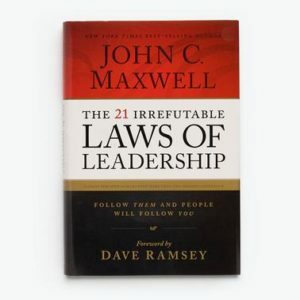 Maxwell, an author and speaker renowned for his work on the topic of leadership, lays out the Law of the Picture as part of his playbook for success in The 21 Irrefutable Laws of Leadership. I’ve been sharing a few of my favorite Laws here on the blog, and this is one of the most vital when it comes to how your team responds to your leadership style. If you want to learn how the Law of the Picture can help your business grow, read on. Chances are your associates will not be able to envision your business’s future goals as clearly as you can because they don’t have the same perspective. It’s up to you to make sure they understand the vision as well as to motivate them to achieve it. How does a good leader do this? By modeling that vision to your employees. As a leader, you need to embody the example of what you want to see in your workers. They’re going to follow your lead, and if you’re not exhibiting the qualities you admire in an employee, they won’t reflect that back to you. So how can you effectively make the Law of the Picture work for your company? Similar to what Maxwell discussed in the Law of Magnetism, you need to work on becoming an ideal leader yourself before you can expect to see a change in your company. First of all, evaluate where you are right now regarding your core values and how successful you are at modeling them. Are there times when the way you act is inconsistent with the values you want to see in your business? Be honest with yourself and look at the times you’ve come up short when it comes to modeling your company’s vision. You might even want to consult a friend or, as Maxwell suggests, a colleague to see where your actions don’t match up with your values. Resist the urge to get defensive—this is an opportunity for you to learn how others honestly see you, which you can use as a jumping-off point for your personal growth. Finally, make a list of the qualities you would like to see in your employees—integrity, loyalty, punctuality, whatever they may be. Think about times you’ve been a good model of these traits as well as times you may not have measured up. Becoming conscious of your behavior is the first step towards being able to adjust it. The Law of the Picture is an ongoing process. You need to continually evaluate your behavior and make tweaks to ensure that you’re always growing. However, if you notice that your employees are no longer modeling your core values, it might be time to look in the mirror and see what kind of example you’re giving them to follow. The Law of the Big Picture can make or break a business, as no employee wants to work for a boss they can’t respect and don’t want to emulate. If you’d like to hear more about the Law of the Picture and how you can model the qualities you’d most like to see in your employees, fill out my contact form and let’s talk.